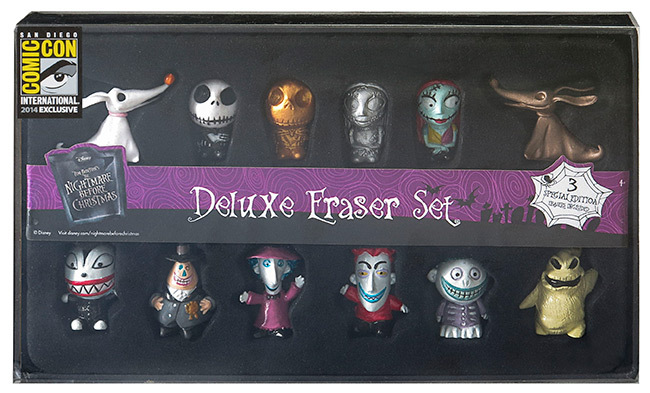 Jack Skellington and all of his gang are here in this hauntingly beautiful collection of The Nightmare Before Christmas Erasers. This set comes in a nice black display box so you can enjoy Halloween all year long. Use them as erasers or keep them as display figures. - Highly detailed and colorful characters! - Great gift for Nightmare Before Christmas fans! - Display unpackaged or packaged. - One Gold Jack Eraser is included. - One Silver Sally is included. - One Bronze Zero is included. - There are only 300 of these in existence, hurry and get one now!